A Guyanese pilot who was investigated by local aviation officials for the unauthorised departure of two planes in 2016, died in a small plane that crashed into the ocean waters off of Long Island, New York. Munidat “Raj” Persaud, 41, of Waterbury, Connecticut, was identified as a victim in the Saturday morning crash, New York State Police said. The plane crashed around 11 a.m. about a mile off of Quogue, New York, in the Hamptons. Persaud and two other people were in the small private plane, a twin-engine Piper PA-34, which had left from Connecticut on Saturday morning and was heading to South Carolina. The other two persons had not been found and their identities have not been released by U.S officials who were still combing the area up to yesterday… (14 Oct 2018). Agencies including the U.S. Coast Guard, the New York Air National Guard and the Suffolk County sheriff’s office responded to the crash. Officials said people on the beach reported the plane sputtering before it crashed. The National Transportation Safety Board (NTSB) tweeted that it will be investigating. An outpouring of tributes flooded Persaud’s Facebook page with his wife, Trisha LA Rose Persaud posting, ‘husband I promise to be at his side forever’. There were also responses to a post made days earlier that read, ‘together we’ll always climb the highest altitude’. 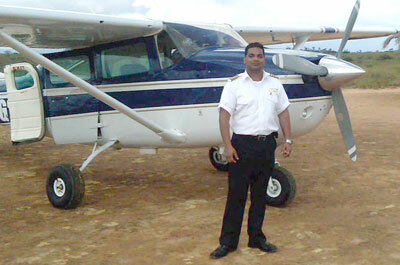 Persaud, a father of two, owned two flight schools in Danbury and Waterbury, according to U.S officials. He made local headlines in 2016 when he, along with another pilot, departed the Eugene F. Correia International Airport (EFCIA), Ogle unknown to authorities in two Cessna 206 aircraft bearing registration 8R-GTP and 8R-GMP. The two had flown undetected to Grenada and then Anguilla before making their way through U.S airspace. The 2016 incident is still the subject of litigation here. Earlier this year, Persaud posted a local newspaper front page story of the incident and called it ‘third world propaganda’. Persaud had set up operations in Guyana to service the interior locations.